The photo above is how I always want to remember Daniel, long after he has died from food poisoning or from sticking his hand into a blender or something equally frustrating and totally avoidable. 1. Twenty or more birthday songs, most of them made up, sung in excessive vibrato. 2. A variation of "[Blank] years ago today we were together. And it was wonderful. Well, it was wonderful for you. I had just gone through a bloody massacre and was moments away from death. You're welcome, by the way." 3. Forgetting that she's leaving a voice message and talking to someone else for a while. 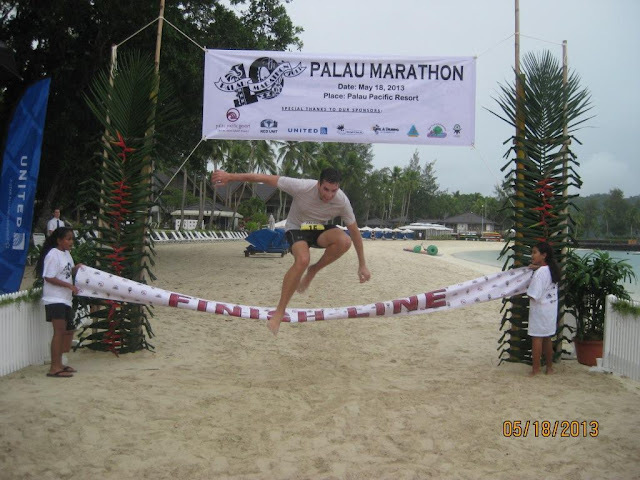 Instead, Daniel and I got up at 1:00 AM to head up north for the Palau Marathon. Fourteen men and three women signed up to run the thing. And it started at the northern part of the big island on the coastline. The big island is mostly jungle and waterfalls with the occasional small village. IT'S SO FREAKING UNBELIEVABLY HOT IN PALAU ALL OF THE TIME ALWAYS!!!! We thought that starting the marathon in the middle of the night would do the trick but when we got out of the car and took a breath of the suffocating muggy air, we knew it was going to be a long day. The race began and within a few minutes Daniel and I were running completely alone. It was surprising how quickly the runners had all spread out. The course was the most difficult one I've ever attempted (this was my sixth marathon) and it seemed that we were constantly running up a steep hill. Cars drove ahead of us and waited every mile or two to offer water and we were very fortunate to have an incredibly enthusiastic senior Mormon missionary couple meet us every two miles along the way with all of our personal items and excessive amounts of cheering. Elder and Sister Carter, you are true saints. The day before the race I had memorized 26 jokes, which I had planned to tell to Daniel at each mile marker along the way. Unfortunately, because I have no self-control, I busted through all 26 of them within the first two miles. By about mile five, it seemed like we both needed some optimism. So that's when I started singing a song from my childhood, very very energetically. Think positive, believe you can! Do anything that you plan! If you will life will treat you grand! Think positive believe you can! Do anything . . . etc. etc. etc. After about 45 rounds of "Think Positive!" sung at the very top of my lungs, Daniel finally spoke up. Daniel: FOR THE LOVE OF ALL THAT IS HOLY PLEASE STOP THAT!!!! Daniel: No, Eli! This has to stop! This can't continue! I can't do this anymore! Daniel: I said STOP! I'm not joking! This cannot go on any longer. Daniel: AND NO HUMMING IT EITHER! Daniel: AND NO SNAPPING AND SINGING IT IN YOUR HEAD! Eli: You are a murderer of happiness, Daniel. A murderer. Not long after that Daniel remembered that he hadn't run for like two months and so he told me to go on up ahead because he needed to slow down. I didn't really train for this thing either but I've been running a little bit each day. Plus I was thinking super positively because of the song, so I was in a better place than Daniel. We split up and before long I was completely alone in the jungle. We were running with headlamps because it was so dark out there. The moon wasn't even out. But after a while I turned mine off so I could just watch the Milky Way above. When I turned my headlamp off, it was surprisingly dark. So much so that I could only see the road for a few steps in front of me at a time. And besides the road, there was really no sign of civilization anywhere. The sounds of jungle suddenly seemed so deafening, and I saw the silhouettes of dozens of bats flying over the road above me. The road was narrow and the tall trees and vines hugged each side as though about to overtake it. And as I ran alone in the darkness I had so many emotions come rushing through me at once. I wasn't sure if it was because I was sleep-deprived or dehydrated or freaked out because of the jungle animals or if it was because it was my birthday and I was just feeling nostalgic, but tears came to my eyes as I thought about how surreal this all was. And for so many reasons I knew this was going to be one of those moments that I would always remember. A moment that was sandwiched within a much greater period of my late 20s in which I have known so much beauty and sadness, peace and struggle, and a number of other things I can't seem to wrap my vocabulary around just now. I was so grateful in that moment that I am where I am and experiencing what I'm experiencing. And I thought about how differently I see the world around me now than I did eight months ago when I first came to Palau and didn't find the solitude so peaceful and the bats so charming. 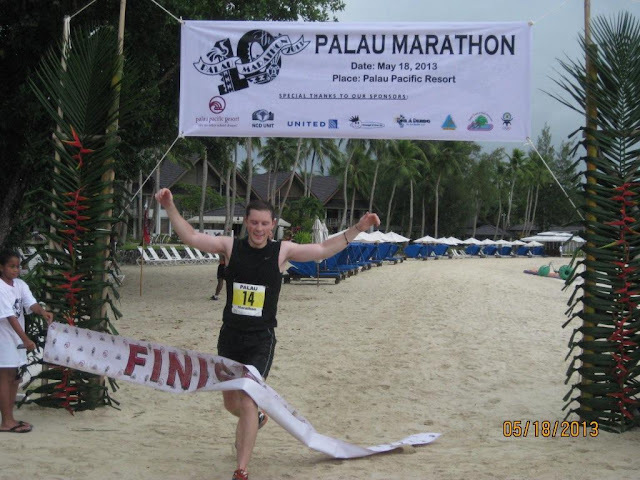 That race through the muggy darkness, all alone, was such a metaphor for my journey through the greater Palau experience this year, and a few of the thoughts in the middle of the night about whether I really was strong enough to make it to the finish were a little too familiar. The race was hard. I mean, really really hard. But as I ran, it being hard didn't seem so preclusive. Because I've been through some hard things recently. Some that have been really really hard. And I just kept thinking, if I could handle *that* surely I can handle this. Eventually light pierced the sky, right around the time that I crossed the bridge over to Koror, the island that most people live on. The last eight or nine painful miles continued up and down hills through town, across a causeway to the island I live on, and passed my apartment building. The course ended on the beach at a resort just down the street from where I live. I crossed the finish line and went straight into the ocean. A while later Daniel came by, now barefoot and looking way too happy. I went home after the race, climbed into bed, and finished turning 29. The transition was magnificent. Beautiful post. Thanks Eli. Your words capture your emotion so perfectly and when I read what you write I always feel like I'm right there with you, feeling what you are feeling and laughing when you laugh. It makes my day so often. Thank you so much for taking the time to write. And happy birthday! 29 is my next one! Lovely post. I'm turning twenty-something this June and I really want things to change. Hope I have a 'transition' like your's. Oh man! I really want things to turn around for me this year. Ever since I turned twenty, life has been all about 'lessons and struggles'! P.S. You weren't kidding when you said that Daniel has reeeally long legs! Happy Late Birthday!!! It sounded like an awesome day!! You can run and cry and run and sing at the same time? I've experienced both and almost hyperventilated both times. ^ I was thinking the same thing! Running is hard all on its own, you can sing and cry and run?! Eli, I think you may be in "Madonna shape". Don't forget dance, too. I'm basically the Barbra Streisand of the running world. With all your talents, you should try for an EGOT! Daniel ran the marathon barefoot? I don't care when he crossed the finish line, Eli. looking too happy? As in he drove to a block away from the finish line happy? As in hasn't worked a day in his life happy. HAPPY BIRTHDAY!!! Most people sleep in and get a 'massage' on their birthday, but I'm super impressed you got up early and ran a marathon, way to bring in another year! Congratulations on another marathon finish! Running in sand is the worst. I can never figure out why they put marathon finishes in sand. That's just mean. Seriously. I want to cry when I have to go up a curb after running that far. Amazing! Those moments are what I live for. They really make you look back and realize just how much you have experienced. Congratz on running in the marathon! And I thought running one of the fastest mile times in my PE class was impressive. You inspire me, Eli. Happy birthday Eli... i'm one of many who sure are glad you're around! Well done and a happy belated birthday! I admire you for your ability to finish things and transform words in your head into written prose. Wonderful! Why did Daniel jump over?